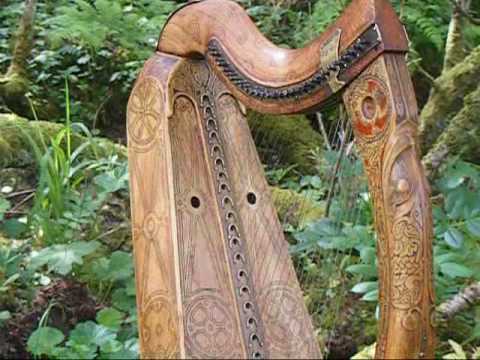 >Celtic Symbolism: Does Celtic Art is sheer celtic? As far as I could research on this subject, much of it’s present expresions are based on the so called Early Medieval art of Britain and Ireland. Art historians typically begin to talk about “Celtic art” only from the La Tène period (broadly 5th to 1st centuries BC) onwards. In this case, I rather prefer to employ the “Insular Art” label also known as “Hiberno-Saxon” art. But does celtic art is sheer celtic?… Certainly not. Masterpieces like the Book of Kells, Book of Durrow, pocket gospels like the Book of Mulling, Book of Deer, Book of Dimma, and the smallest of all, the Stonyhurst Gospel (now British Library), plus insular decorations and designs like spirals, triskeles, knotworks, carvings in stone, especially stone crosses, circles and other geometric motifs, are perhaps the most related examples of evoking celtic art. But Celtic Art has it’s own influences from other peoples…. The animal forms probably derive from the Germanic version of the general Eurasian animal style, though also from Celtic art, where heads terminating scrolls were common. Interlace was used by both these traditions, as well as Roman art (for example in floor mosaics) and other possible influences such as Coptic art, and its use was taken to new levels in insular art, where it was combined with the other elements already mentioned. The interlace patterns that are often regarded as typical of “Celtic art” were in fact introduced to Insular art from the Mediterranean, both directly and via the animal Style II of Germanic Migration Period art, though they were taken up with great skill and enthusiasm by Celtic artists in metalwork and illuminated manuscripts. Some sources distinguish between a “wider period between the 5th and 11th centuries, from the departure of the Romans to the beginnings of the Romanesque style” and a “more specific phase from the 6th to 9th centuries, between the conversion to Christianity and the Viking settlements”. C. R. Dodwell, on the other hand, says that in Ireland “the Insular style continued almost unchallenged until the Anglo Norman invasion of 1170; indeed examples of it occur even as late as the thirteenth and fourteenth centuries”. Most Insular art originates from the Irish monasticism of Celtic Christianity, or metalwork for the secular elite, and the period begins around 600 AD with the combining of ‘Celtic’ styles and Anglo-Saxon (English) styles (‘zoomorphic interlace’ decoration as found at Sutton Hoo). The finest period of the style was brought to an end by the disruption to monastic centres and aristocratic life of the Viking raids which began in earnest in the late 8th century. 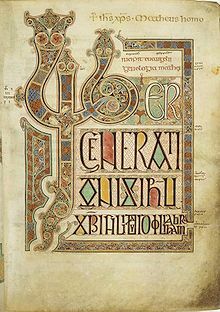 These are presumed to have interrupted work on the Book of Kells, and no later Gospel books are as heavily or finely illuminated as the masterpieces of the 8th century. But perhaps the most relevant matter is that the influence of insular art affected all subsequent European medieval art, especially in the decorative elements of Romanesque and Gothic manuscripts. 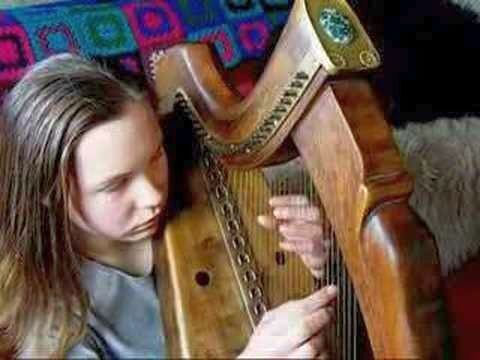 The so called “Celtic Revival” movement was the responsible of recovering and supporting celti arts expressions, including a variety of movements and trends, mostly in the 19th and 20th centuries, which drew on the traditions of Celtic literature and Celtic art, or in fact more often what art historians call Insular art. It began as a conscious effort mostly in the British Isles, to express self-identification and nationalism, and became popular well beyond the Celtic nations, and whose style is still current in various popular forms, from Celtic cross funerary monuments to interlace tattoos. 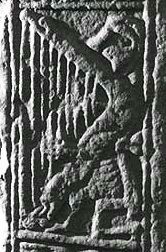 Coinciding with the beginnings of a coherent archaeological understanding of the earlier periods, the style self-consciously used motifs closely copied from works of the earlier periods, more often the Insular than the Iron Age. Another influence was that of late La Tène “vegetal” art on the Art Nouveau movement. The late 19th century reintroduction of monumental Celtic crosses for graves and other memorials has arguably been the most enduring aspect of the revival, and one that has spread well outside areas and populations with a specific Celtic heritage. Interlace typically features on these, and has also been used as a style of architectural decoration, especially in America around 1900, by architects such as Louis Sullivan, and in stained glass by Thomas A. O’Shaughnessy, both based in Chicago, with its large Irish-American population. The “plastic style” of early Celtic art was one of the elements feeding into Art Nouveau decorative style, very consciously so in the work of designers like the Manxman Archibald Knox, who did much work for Liberty & Co..
Interlace, which is still seen as a “Celtic” form of decoration, somewhat ignoring its Germanic origins and equally prominent place in Anglo-Saxon and Scandinavian medieval art, has remained a motif in many forms of popular design, especially in Celtic countries, and above all Ireland, where it remains a national style signature. The Secret of Kells is an animated feature film of 2009 set during the creation of the Book of Kells which makes much use of Insular design. 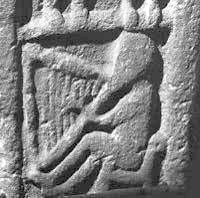 As Stephen Walker comment in Dalriada Magazine , “a few Celtic motifs have meanings that are more-or-less a consensus of contemporary Celtic designers and artists. The meanings attached to these symbols can often be traced to the rediscovery of Ireland’s cultural history in Victorian times as well as the emerging sense of national identity in Scotland, Wales, Isle of Man, Cornwall and Brittany as these cultures struggled to maintain their unique traditions and characteristics”. The current Renaissance of Celtic Art adds new agendas and a new imagination about how the old relates to the new. Some recent Celtic symbolism is very innovative adaptations of contemporary concerns, intellectual fashions and spiritual trends. Artists are by their nature creative and imaginative. An intuitive sense of symbolism should be recognized for what it is; the communicative intent of the artist. >Celtic Cookery : How much more basic can you get Oatcakes? On a previous post I wrote about the Beltaine festival and it’s widely spread traditional Scottish food the “Bannocks” which are in fact ate on every celtic festival. Let’s have a further review on it’s irish parallel quoted from the book “Ireland: Dublin, the Shannon, Limerick, Cork, and the Kilkenny Races” by Johann Georg Kohl , 1844 . Posted by kind permission of Conrad Bladey . All rights reserved by the author. Take oats, mix them in water and let it dry out. Quite basic. Oatcakes are pan Celtic-wherever oats were found. In Scottish farm houses in the 19th century left over oat porridge was placed into a wooden drawer. There it dried out and was sliced and heated to crisp. Surely the oat cake is ancient and a root food. I returned on foot to the little cabin upon the barren hillock where we had left our cars, and as a hard shower of.hail was falling over the dark plain and among the old ruins, I was compelled, for the sake of shelter, to take a closer inspection of the interior of this cabin. This gave me an opportunity of watching the preparation of those oat-cakes which play so important u part in the national cookery both of Ireland and Scotland, and which are even found carved upon their monuments, as I have above described, These far-famed cakes are made of oats very roughly ground. The coarse flour is mixed with water, into a thick gritty paste, and spread upon a warmed iron plate. This round iron plate, which is found in the poorest Irish, cabins, is warmed by a handful of lighted straw placed underneath it, and in a few moments the cooking process is over, the paste being taken off in the shape of a hard, thin, dry biscuit. This paste is dignified by the name of cake, and is eaten daily by the poor Scotch and Irish. These cakes are not much more palatable than a mixture of flour and water, made dry and hard, would be, yet many people are passionately fond of them. The Irish generally assure the stranger, when they show him their oat-cakes, that these are a particularly wholesome, nourishing, nndstrengtheningkindof food, which can be true only when they are compared with the watery, tasteless, and meager potatoes upon which the Irish have to subsist. Oats as it turns out are also healthy. Lower your fats! Here is how to connect with the ancient oaten past. Place in food processor- run on high adding oats slowly till a powdery flour is obtained. As fine as you can get it without too much work. If you don’t’ mind fat add in a few tablespoons of bacon fat. If you don’t mind oil add in a few tablespoons of some form of oil- I found olive oil worked. So be healthy…. Once you grind the flour add in about a cup of whole oats. Place flour mixture in electric mixer- a strong one. Slowly add cold water till it thickens to a stiff dough but not too hard. The paddle should still turn well enough. Switch paddle to dough hook and run on high for about two minutes. The dough will now be hard- don’t worry break it into small bits and pout back into your mixer. Add more cold water and beat with paddle blade till you have a medium stiff mixture. The paddle turns but does not strain. Once dough is re-constituted roll out to thickness of choice- I like about 1/8 inch. Thinner ones tend to scorch and cook too fast. Toss oat flour and whole oats on the board to flour it so that some oats get stuck to the surface of the dough- not many just the occasional one or several per oatie…. Basically all you are doing is drying them out so if you want to get it done quicker simply raise the temp but keep an eye on them. They are done when between crisp and slightly chewy. Some like them totally crisp. Beware of scorching. Watch carefully even when on low heat. Place hot oaties into a metal tin with tight lid right out of oven. This helps redistribute the heat and even out the cooking. Stone circles and standing stones have always fascinated me, their symbolism and astronomical study undoubtedly render an extra quote to it’s complex ritualistic landscape. 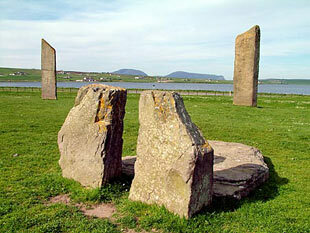 The Standing Stones of Stenness is a Neolithic monument on the mainland of Orkney, Scotland. Various traditions associated with the stones survived into the modern era and they form part of the “Heart of Neolithic Orkney” World Heritage Site, and inscribed as a World Heritage site in December 1999. The surviving stones are sited on a promontory at the south bank of the stream that joins the southern ends of the sea loch Loch of Stenness and the freshwater Loch of Harray. The name, which is pronounced stane-is in Orcadian dialect, comes from Old Norse meaning stone headland. The stream is now bridged, but at one time was crossed by a stepping stone causeway, and the Ring of Brodgar lies about 1.2 km (3/4 mile) away to the north-west, across the stream and near the tip of the isthmus formed between the two lochs. Maeshowe chambered cairn is about 1.2 km (3/4 mile) to the east of the Standing Stones of Stenness and several other Neolithic monuments also lie in the vicinity, suggesting that this area had particular importance. Other megaliths in the vicinity, now thought to have been part of the original complex, are the Watchstone , a massive slab of stone that towers over the Brig o’ Brodgar, and the Barnhouse Stone , a solitary stone to the south-east, between Maeshowe and the Standing Stones. Until the beginning of the 19th century, the complex contained at least one other significant monolith – the Odin Stone of Orkney legend. The Standing Stones o’ Stenness were originally laid out in an ellipse. Although it is commonly written that the monument was once made up of 12 megaliths, excavations in the 1970s suggest that the ring was never “completed”, with at least one – possibly two – of the 12 stones were never erected. Radio-carbon dates from the excavation show that the site dates from at least 3100BC, making the Standing Stones complex one of the earliest stone circles in Britain . Like the Ring o’ Brodgar, the Stenness ring has been classed as a henge monument. The stone circle was originally surrounded by a rock-cut ditch (four metres across and 2.3 metres deep), outside of which was a substantial earth bank. The layout of the Standing Stones o’ Stenness. The surviving stones are shown in black, with the sockets in grey. Doubt remains whether Stone 12 existed, and possibly Stone 9. With an approximate diameter of 44 metres (144 feet), the earth bank had a single entrance causeway on the north side, facing the Neolithic Barnhouse settlement on the shore of the Harray loch. Little remains of the bank, or ditch, today, although traces remain visible around the stone circle. Today, at the centre of the ring, the visitor will see a large stone hearth, similar to those found in Skara Brae and other Neolithic settlements. 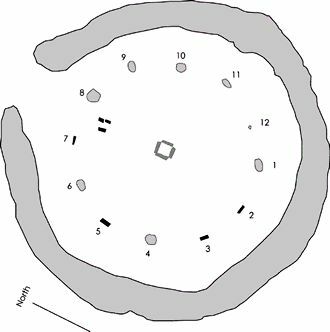 The hearth was constructed from four large stone slabs, and, according to Dr Colin Richards, the excavator of the nearby Barnhouse Settlement, an earlier hearth was transplanted from Barnhouse to the centre of the stone ring. Close to the hearth stand two angular slabs, standing side by side, with a large prone stone beside them. This is the remains of the “dolmen” rebuilt in 1907 – although doubt remains that it was ever part of the original complex. Ring O’ Brodgar was supposedly known as “the Temple o’ the Sun”, with the Stenness henge being “the Temple o’ the Moon”. Even in the 18th century the site was still associated with traditions and rituals, by then relating to Norse gods. It was visited by Walter Scott in 1814. Other antiquarians documented the stones and recorded local traditions and beliefs about them. One stone, known as the “Odin Stone” was pierced with a circular hole, and was used by local couples for plighting engagements by holding hands through the gap. It was also associated with other ceremonies and believed to have magical power. 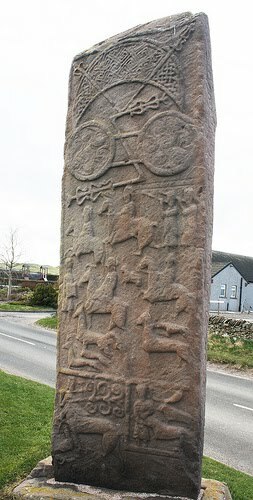 “The most stately monument of this sort [circles of detached stones] in Scotland, and probably inferior to none in England, excepting Stonehenge, is formed by what are called the Standing Stones of Stenhouse, in the island of Pomona in the Orkneys, where it can scarcely be supposed that Druids ever penetrated. In 1907, Scott’s “altar” was reconstructed to form just that – a table-like dolmen structure in the centre of the stone circle (see pictures right). This construction remained standing until September 1972, when the dolmen was toppled – officially explained away as the result of a drunken prank. In 1906, the Stones o’ Stenness were taken into state care and the toppled stone re-erected. While this was being carried out, another, smaller, stone was found under the turf and raised using an existing socket-hole. At the time, doubts were raised as to whether this small stone (pictured right, alongside the remains of the “dolmen”) belonged in a circle that contained such huge megaliths. The monuments at the heart of Neolithic Orkney and Skara Brae proclaim the triumphs of the human spirit in early ages and isolated places. They were approximately contemporary with the mastabas of the archaic period of Egypt (first and second dynasties), the brick temples of Sumeria, and the first cities of the Harappa culture in India, and a century or two earlier than the Golden Age of China. Unusually fine for their early date, and with a remarkably rich survival of evidence, these sites stand as a visible symbol of the achievements of early peoples away from the traditional centres of civilisation…Stenness is a unique and early expression of the ritual customs of the people who buried their dead in tombs like Maes Howe and lived in settlements like Skara Brae. he smiles when I am happy, and will cry when I am blue.. I share with you this interesting album review previously posted by Mike Wilson on his awesome blog. All rights reserved by the author and posted under his kind permission. Brendan Hendry hails from Bellaghy in South Derry. November 2008 saw the launch of the instrumental album TUNED UP an album which has capured the heart of those people who have listened to it and reviewed it. 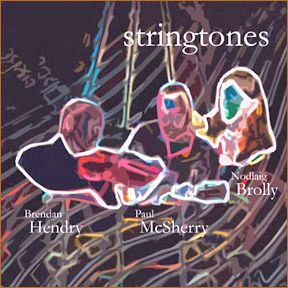 “Stringtones” offers a selective trio of distinguished musicians from Northern Ireland, playing slightly more than a trio of instruments: Brendan Hendry on fiddle, Paul McSherry on guitar and bouzouki, and Nodlaig Brolly on Cláirseach (harp), piano and vocals. I’m of the opinion that where music is concerned, trios always work really well, and my theory is proven well by this crisp and pleasant recording. Ample variety is provided by the three musicians to maintain interest from start to finish, yet there also remains plenty of room to appreciate their plentiful individual talents across a range of traditional and self-penned material. Raw energy is supplied by the combination of Hendry’s fluid fiddle and the supple rhythmic edge of McSherry’s guitar and bouzouki, demonstrated to great effect on a number of sets of jigs and reels. A rumbustious set of reels, “The Street Cleaner/McDonagh’s/The Bluffer’s Guide,” races away from the outset, lead by the pulsating pace of Hendry’s flirtatious fiddle. “Mick Hendry’s/Maisie Hendry’s” is a beautiful pairing of two jigs, composed by Hendry for his parents, and striding forward with real purpose, brimming with a knowing sense of pride. The jigs are served particularly well by the rippling undercurrent provided by Brolly’s shimmering cláirseach. Heralding the start of “Deirdre’s Lament,” the sheer elegance of Brolly’s piano is only surpassed by the understated, natural beauty of her voice, as she delivers this achingly gorgeous ballad with Hendry’s weeping fiddle heightening the emotions of the story. Brolly similarly demonstrates the haunting lilt of her voice on “An Leanbh Aimhréidh,” where the restrained, sparing musical accompaniment turns this compassionate tale into a real delight. A similarly tender treat awaits on “Ceann Dubh Dílis”. A typically beguiling Phil Cunningham composition, “The Tin Hut On Staffin Island,” provides a wonderful opportunity for each musician to display their utmost grace as they glide with fluid majesty through this beautiful slow reel. The slow air, “Mrs Jameson’s Favourite,” scales these heights of alluring composure even further, bearing a sumptuous elixir to sooth the heart and mind. Stringtones is a genuinely lovely album: devoid of any pretentiousness, but basking in that warm glow that can only be the result of genuine talent and devotion. Feel free to find out more info on the official Web site of the Irish traditional fiddle player, Brendan Hendry.